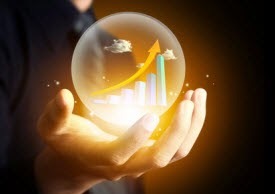 Predictive analytics is a branch of data mining that focuses on the prediction of future probabilities, trends and behavior. It has recently become a hot topic amongst big data fanatics and rightly so. The ability to predict future successes or failures hold value in any industry; sales, marketing, fraud detection, customer relationship management, and more. This is traditionally done by exploiting patterns found in historical, transactional and customer data to identify and optimize risks and opportunities through machine learning. The power of using machine learning capabilities to collect and organize this data is even more disruptive to an industry when you can collect different forms of data than your competitors; like spoken data. Using machine indexing to recognize which words are being spoken in a recording and making that data available to be combed for patterns, relationships and trends gives you access to answers you've never had access to before. What if you could identify words that correlated with a high cancellation rate, and were then able to red flag customers who said those words on their next call? What if you could define words that correlated with a high purchase rate, then you could more accurately predict next quarter sales. What if you could recognize when credit card details were spoken in a recording, and then run a check for fraudulence? Imagine the possibilities if you could mine for data in the spoken content of your business' everyday interactions automatically with machine learning. Currently the data we get out of spoken interactions are suspect to human interpretation and error. A salesperson can define where they think customers are in the buying process and how close they are to making a purchase. But wouldn't it be better to not leave that to human bias? Wouldn't it be better if machine learning could take over. By observing and defining the patterns of 1000 calls, which ended in sales, the machine could now predict what probability there was that a new call would end in a sale. What about identifying the best ways to reach and engage with different customers? The possibilities of machine learning are endless, literally. You just have to decide how and when to take advantage of it. The combination of sales and marketing automation has already been proven as one of the most successful combinations since PB&J. Companies like Salesforce.com and Marketo have been wildly successful in automating the sales process by combining valuable data and turning it into tools for lead generation, lead nurturing and lead scoring, all based on human input information and data mining. There are more opportunities out there for this kind of disruption, you just have to find the right data to dig through. What industry disrupting predictions are you missing by not indexing your spoken information?